I read an article recently that talked about how binge watching has become a big thing recently with Netflix, Hulu and other contenders offering full seasons instead of one show once a week. I know of what they speak; I find myself sucked into these binge-watching sessions. I have to be careful when I start a show to have a time limit or else the entire night passes and I'm still sitting there soaking in someone else's life. 1. Parenthood. I was late in the game of fangirling this show but man, was it worth the wait! Beautifully done, people, beautifully done. If you want a family show for parents, this is it! 2. Call the Midwife. Oh how these women love the patients they care for. The dignity, the compassion and the firm hand when needed; these women show me what love looks like. If you're looking for a touching time-period show, this is for you. 3. Gilmore Girls. Yes, I'm just now watching this show. It was my consolation for Parenthood ending. It took me a few episodes to really enjoy it, but I am hooked now. It combines humor and family dynamics with just the right mix. 4. Parks and Recreation. I have laughed hard enough to choke on this series. Amy Poehler's portrayal of Leslie Knopp is outstanding; you can't help but fall in love with her driven, overly-organized, innocent character. The writing on this show is so hilariously masterful that I must insist you sit down to watch this immediately! 5. Unbreakable Kimmy Schmidt. A comedy about a woman emerging into the world after being hidden away in an underground cult for fifteen years. It follows her adjustment to the world she thought vanished in the apocalypse. The actress who plays Kimmy does a superb job of being child-like yet fierce. I'm not sure I can explain why I like it so much, but I do. People seem to either love this show or hate it. I'm on the love team! 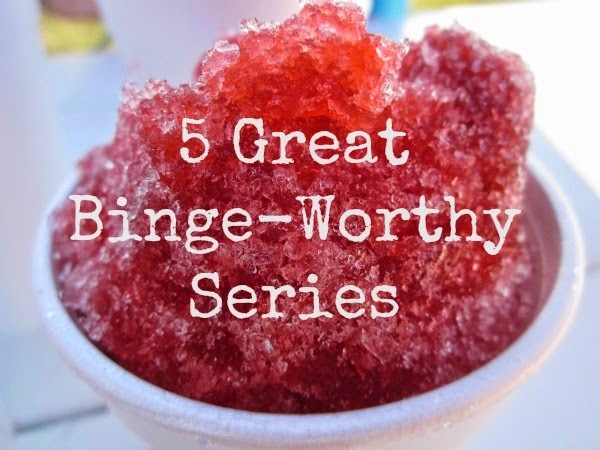 Do you binge watch? What shows are you enjoying? So I guess you're not a fan, Kimberly? :) My husband's not either. He prefers crime shows.